One of our favorite desserts is Outback's Cinnamon Apple Oblivion. A few years ago, they removed it from the menu. My girls' emotions vacillated between shock, grief and outrage. They are very passionate about the food they love... I wonder where they got that from? As luck would have it, I came across a similar version and adapted it. Now that I can make it at home, all is well. I don't like things overly sweet... my kids DO. I leave the caramel and whipped cream off of mine. The girls load theirs down. When I am feeling ambitious, I make my own cinnamon apples. Read through the entire process before beginning. Pecan-covered ice cream scoops and cinnamon-sugar croutons can be made ahead in order to shorten prep time. The original recipe was published to make four large servings, but can be divided up to make smaller portions. If you are eating this after a meal, you really don't need that much dessert to satisfy your sweet tooth... portion control, people! Just a few bites will do. Preheat oven to 300 degrees. Cut bread into large cubes. Place on an ungreased cookie sheet and bake for ten minutes. Stir to turn cubes, then bake five or ten minutes more until bread is brown and crispy. While bread is toasting, melt butter in a skillet. Dump baked croutons into skillet and saute until bread is coated with butter. Mix the cinnamon and sugar together, then sprinkle over croutons, stirring to coat. Remove from heat and place on baking pan to cool. These can be made ahead and stored in an airtight container. Scoop out desired amount of ice cream, one scoop per serving. 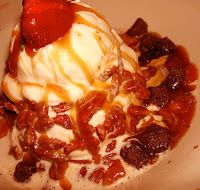 Roll ice cream in chopped, candied pecans. This step may be done ahead of time and stored in freezer. Warm apples in microwave until hot. For each serving, drizzle a small amount of caramel sauce onto each plate. Place a pecan covered ice cream ball on top. Spoon warm apples around it on plate. 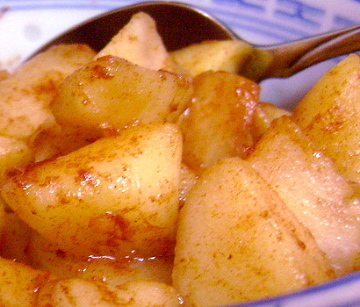 Scatter cinnamon croutons among the apples. Top with a dollop of whipped cream and top with a sliced strawberry.